On Nutrition: What are Carbohydrates | Coach Billy. Carbohydrates are one of the three major macronutrients that the body needs for proper functioning. It is the body’s main fuel not just to move those muscles, but most importantly to keep your brain working. Many fad diets promote carbohydrate depletion and carbohydrate fasting, which is contradictory to the essential purpose of this macronutrient. It is important to understand what the uses of carbohydrates in the body are and how the body utilizes carbohydrates to maximize this efficient fuel source. How does the body use Carbohydrates? The body uses carbohydrates for various and important functions. Primarily, carbohydrates are important for brain functioning. The brain exclusively uses the blood sugar glucose – the type of carbohydrate found inside the body – for its normal functioning, and the body does well to balance blood sugar levels to keep the brain fueled. Carbohydrates are also used by skeletal muscles for contraction and by smooth muscles of internal organs. The body mainly uses carbohydrates for high intensity exercises. Without carbohydrates to fuel movement, the body will look for other sources of energy which is usually protein converted into glucose. The body breaks down protein in the liver to produce the needed fuel if you do not have enough carbohydrates in your diet. Sufficient carbohydrate supply keeps the liver from using protein as an energy source so that protein can be used for more important functions in tissue growth, maintenance, and repair. Last but not the least, carbohydrates are the key to fat oxidation in the Krebs cycle. The body needs energy from carbohydrates to start up its engine that burns fat for fuel. This means that the body cannot burn fat if you deprive yourself of carbohydrates. What are the types of Cabohydrates? With regards to Carbohydrate consumption, it is the structure of these chemical compounds that determine how the body uses it. Understanding the types of Carbohydrates is important to know which ones are needed for quick recovery, maintain balanced energy in the body during competition, or which ones are best for general health. It is the chemical structure of Carbohydrates that dictates how it is absorbed by the body. Glucose is a monosaccharide that is used by human cells and can be easily absorbed by the body from your diet, broken down from more complex types, or produced by the liver through the process called gluconeogenesis. Other monosaccharides are fructose and galactose. Oligosaccharides are composed of 2 to 10 monosaccharides that are bonded together. Examples of oligosaccharides are table sugars or sucrose, maltose, and lactose. Sucrose can be abundantly found in processed food. Other oligosaccharides are milk sugars or lactose, and grain sugars or maltose. Food sources for simple sugars are table sugars, corn syrup, fruits, malt igredients, honey, and other sweeteners. Complex carbohydrates are polysaccharides which means that its chemical component is compound consisting from 10 to thousands of monosaccharides. In practical application this simply means that generally, the body breaks down complex carbohydrates at a much slower pace than simple carbohydrates. 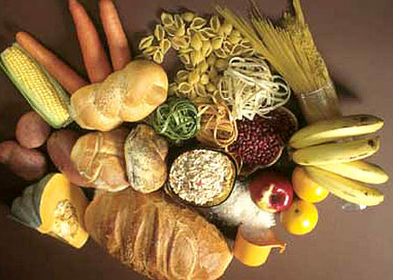 Starch and fiber are sources for complex carbohydrates from plants and glycogen is from animals. Complex carbohydrates usually refer to starch which can be derived from eating bread, cereal, pasta peas and beans, potatoes, and pastries. Fiber is a non-starch and non-digestible complex carbohydrate that can be derived from eating food like leafy vegetables, fruit coverings, oats, brown rice, and wheat bran. Eatig a high-fiber diet does not directly affect sports performance but it promotes general health and prevents chronic diseases. So when should you eat simple carbohydrates and when should you eat complex carbohydrates? A good way to determine which kind of carbohydrate to eat is to know its Glycemic Index. Basically, the Glycemic Index (GI) of a food tells how fast the food source is processed and absorbed by the body. Sugars in most sports drink or soda have a high GI which means that the body absorbs them quickly. It was mentioned before that generally, complex carbohydrates are broken down at a much slower pace than simple carbohydrates, but it also depends on the GI of the food. It is best to consume simple carbohydrates with high GI after a long or intense physical activity or when your energy is depleted from exercising. Simple carbohydrates can be easily absorbed by the body and replenish lost energy stores. Also for long-duration athletes like runners or marathoners, consuming high-glycemic carbohydrates is essential in maintaining their blood glucose level during their endurance events or training. Complex carbohydrates with low GI are ideal to be eaten in between exercise or training sessions to promote energy storage. Note again that not all complex carbohydrates have low GI. Also, cooking or processing of food changes the chemical structure of carbohydrate sources. It is better to eat unprocessed carbohydrates to maximize its benefits. How much Carbs should I eat? The daily requirements for each macronutrient depends on your age, gender, height, weight, and even physical activity. Generally, 45 to 65% of total daily calories should come from Carbohydrates. Athletes need to replace lost energy from training and they may require up to 70% of calories from carbohydrates in a day! Since carbohydrates are the main fuel for your brain and muscles you definitely need much of it every day even if you are not involved in any sport. Unlike Protein and Fats, there are no minimum daily recommended allowance for Carbohydrates. This is because the body can generate fuel from other sources apart from Carbohydrates but remember that this may mean breaking down muscle protein and deprives your brain of energy. Generally, 180 to 300 grams of Carbohydrate is enough to fuel your day. If you take part in intense physical activities such as sports, you might need to consume up to 400 grams per day to replace lost fuel. If there is such a thing as a nutritional secret, then that would be balance. Eat a balanced diet composed of simple and complex carbohydrates, fats, and proteins. These are macronutrients that your body needs for fuel, repair, and proper functioning. Choose organic or unprocessed foods for your fuel source. Processing alters the chemical composition of food which not only lessens the health benefits of the food but sometimes may even cause other negative effects such as diabetes and heart disease. Before and during high intensity activities, consume carbohydrates with high Glycemic Index to provide fuel for your work out. In between exercise bouts, consume carbohydrates with low Glycemic Index to maintain your blood sugar and keep your body fueled for the next work outs. If you are trying to lose weight, it is not wise to undergo carbohydrate depletion or fasting. Think about losing fat, and not merely losing weight – there is a big difference. Remember that your body needs carbohydrates to burn fat, and you burn fat through exercise. If you want to limit your carbohydrate consumption, consume at least 70 grams of carbohydrates per day to keep your brain fueled. Talk to your nutritionist or dietitian for more understanding on carbohydrate consumption and what will work best for you.